March 1st Deadline. Purchase a new canvas from the Knotted Needle and Meredith Willett national instructor and owner of the Meredith Collection will design stitches just for you. Instructor Bio: A love of all things needlepoint, from the rough texture of needlepoint canvas to the smooth glide of silk, inspired Meredith to teach this beautiful hand-craft. She has happily shared her knowledge with local stitchers as well as with stitchers around the country. Meredith is a member of the American Needlepoint Guild and teaches at national seminars. She also teaches for local guilds, including ANG, the Embroiders Guild of America, and at The National NeedleArts Association markets. 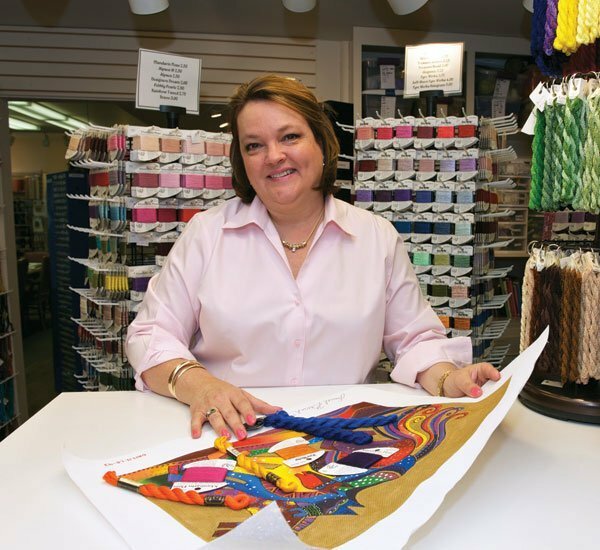 Meredith is frequently invited to teach at retail shops throughout the country She has had articles published in the national magazine Needlepointers and the independent magazine Needlepoint Now. Along with her magazine writing, teaching, and retail business, Meredith and friend Beth Robertson, have co-authored Knots, Fur and Turkeywork. Always eager to learn, Meredith has attended classes at the Royal School of Needlework in London, England; studied gold work in several museums and cathedrals in England and Scotland; and, has taken gold work classes from Jane Lemon and Tracy Franklin. Meredith's knowledge is generously shared with her students.